The good news is that San Francisco's NPR affiliate KALW has agreed to clear time for a five-part documentary, "Winter Soldier: Witnesses to Occupation," to air this November. After its initial broadcast, KALW will syndicate the massive project to other NPR stations, bringing the true stories of the human costs of war to millions of listeners across the United States. The bad news is that although KALW is committed to broadcasting this project, it has not agreed to fund it, leaving me and producer Esther Manilla to raise the $10,000 necessary to produce the series. Please donate what you can to make this historic broadcast happen. Help us bring the true face of war to the American audience. Polar bears are top carnivores but are helpless in the face of loss of their habitat. Because of global warming, ice floes that polar bears live on are melting, leaving nowhere for the bears to sustain themselves. (Los Angeles) In the last century, a greater proportion of Southern California has burned than that of any other part of the country. Chaparral shrublands — not forest — cover much of our landscape and account for the vast majority of what burns. The United States Forest Service, which devotes more than half of its budget to fire-related activities, spends most of that money to protect residences built in these shrublands. Yet we have just seen, for the second time in less than a decade, wind-driven fires causing at least $1 billion in damage. The magnitude of these events makes it clear that it is time to re-evaluate the wildfire problem and how we deal with it as a matter of public policy. There is much confusion over the causes and behavior of these fires. Some people contend that fire suppression is itself responsible for the catastrophic events, because it has allowed for an unnatural accumulation of flammable vegetation. But while it’s true that fire suppression has affected fire behavior and intensity in many forests, it is not true of the chaparral that constitutes much of Southern California’s undeveloped land, and more than 95 percent of what burned last week. Fire suppression over the past century has failed to eliminate fire on these landscapes. In fact, recent estimates from the Forest Service suggest that most of the area has burned more often in the past hundred years than in the centuries before that. So it’s not as if we have allowed more flammable vegetation to accumulate than when nature alone was in charge. In any case, fires pushed by strong Santa Ana winds are only weakly affected by the amount of fuel in their path. This is evident from last week’s fires, which consumed more than 60,000 acres of the same landscape in San Diego County that burned in the 2003 inferno. In other words, even the extensive burning just four years ago did little to stop the recent fires. In addition to being inaccurate, the theory that fire suppression is responsible for large destructive wildfires is outright dangerous. It casts blame on firefighters and even suggests that we stop suppressing fires on these shrublands, even though they are home to a large population. And it shifts our focus away from real solutions, which are tied to local land planning and development patterns. Large, high-intensity wildfires are a natural feature of the Southern California landscape, and we have limited ability to stop those that begin during the autumn Santa Ana winds. The best we can do is alter our behavior in ways that limit our vulnerability. There is no one simple way to reduce fire risk, but we can learn many strategies by examining not only where houses have burned but also where they did not. It makes sense to begin by restricting the location and design of new housing developments, requiring the use of fire-resistant building materials and maintaining “defensible” space around houses. Greater use of parks and other open recreational areas on the periphery of neighborhoods that abut undeveloped lands can also contribute greatly to protecting communities from fire. Downed power lines are responsible for igniting some of the recent large fires as well as previous catastrophic ones. Running power lines underground is expensive, but would be a worthwhile investment given the high cost of fighting fires and the billions of dollars in losses that fires cause. Most fires in Southern California begin on roads, often when car fires ignite vegetation or when cigarettes are carelessly discarded. Low cinderblock walls built along fire-prone stretches of highways — similar to those that are used along freeways as sound barriers in cities — would greatly limit the spread of fire. And given that many fires result from sparks produced by construction equipment like welders, chain saws, mowers and chippers, it would be useful to limit these activities during the Santa Ana winds. Trying to eradicate all chaparral wildfires in Southern California will continue to be futile. With the population expected to double in the next 40 years, we can expect fires to only increase. We should think of them as we think of earthquakes: we can’t stop them, so we must accept them as a natural hazard and figure out how to withstand them. Watching television may be bad for the kids; making televisions, it seems, may be bad for the climate. To produce flat-panel displays, manufacturers rely on nitrogen trifluoride (NF3), a potent greenhouse gas that was not covered by the emissions-regulating Kyoto Protocol when it was drafted in 1997, because so little of it was used then. Now exploding sales of flat-panel TVs and other digital devices, coupled with incomplete recapture of the chemical during manufacture, could spell trouble, warn (researchers at UC Irvine). did so in a pointed yet gentle way. But he wasn't joking. watching us, you're going to miss this thing. "But nothing they're saying is of any import because nobody filters it. is? I don't know. Let's go to 'The Situation Room.' "
guys are in the business. You're not on anyone's team. You're on our team. is considered one of its greatest presidents. a beer with him. He would have been a terrible president. He's an elitist. He railed on the political media's poll-based coverage. answer? That's not even a metric you can measure. 'Is McCain too old?' "
conversations with various editors and national journalists. Stewart's passion to have a more aggressive national press. from the one he sees on television. sources that they can't report critically on them. could make such a point. "He is passionate about politics and journalism, and he really cares,"
"usually tries to pick out what's funny about the situation." Stewart's frustration with the 24-hour networks is a double-edged sword. time to draw the line. We're getting our asses kicked here." We reviewed Jim Swanson's new book The Bush League of Nations back in April. Now Jim has a blog about his book. Just click the link above to read all about it. Also, you can buy Jim's book right here on Riptide (scroll down our right sidebar to shop at our Amazon store). Sands of Time: Are Our Beaches Disappearing? Parts of Manor beach seem to be disappearing. You used to be able to walk all the way to Mussel Rock. The normal pattern is that the sand washes out during the year, then gets piled high during storm season. This year much more than the normal amount of sand has washed out (six to ten feet). Just go look at the bottom of the steps from Land's End to see what I mean. Those were on the level of the beach, not above it as they are now. No, it's not global warming. The water, as shown by the offshore rocks, is where it always has been. So what is it? Are we due for an El Nino year? I am waiting to see what this winter's storm season will bring. John Francis, Ph.D., is known the world over as the Planetwalker. In 1971, he witnessed an oil spill in San Francisco Bay. The effects of the spill compelled him to stop using motorized vehicles. Several months later, he took a vow of silence. His non-motorized lifestyle lasted 22 years, and his silence 17. During that time Dr. Francis walked across the United States, earning a B.A., an M.S. and a Ph.D. He later sailed and walked through the Caribbean and then walked the length of South America. During this time he was appointed United Nations Environment Goodwill Ambassador and recently was a speaker at the prestigious 2008 TED conference in Monterey. He is the author of Planetwalker: 17 Years of Silence. 22 Years of Walking. The power of the pen could land them in the pen. Typo vigilantes were busted for editing national park signs, and they could be banned from all national parks. We’re happy to report that we’ve officially concluded this summer’s large-scale restoration work at Mori! This year’s trail work has been completed and several restoration sites have been regraded back to a more natural state. The chain link fences around our staging sites have been removed; now more rustic and subtle recycled redwood fences have replaced the orange plastic fences to protect the healing land. 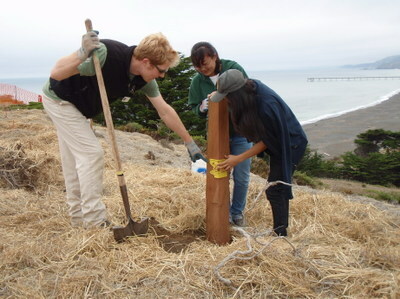 Several volunteer groups helped install these attractive fences, including an Americorp program from Saint Louis, the GGNRA Trail Keepers, the LINC high school program, and Site Stewardship volunteers. All of the new trails are officially open for your enjoyment! The final stages of this project included adding a drainage swale along Old Mori Road (to help keep the road drier during the winter) and completing the Pollywog Path, including replacing the bridge that connects the Park to Fairway Drive. The new bridge is flatter than the old one, making it easier for stroller-pushing parents, bikers, and other park users passing by. The bridge is also reinforced to support groups of nature enthusiasts who stop by the area to watch the California red-legged frogs in the water below the bridge. Fairway neighbors have told us they’ve really been enjoying these improvements over the past few weeks. 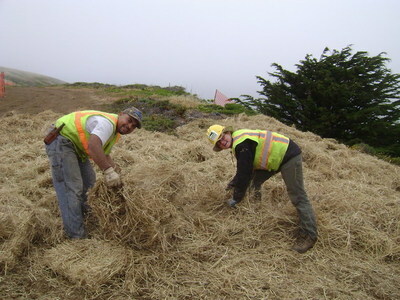 In addition to planting native plants near the trails and along the restored areas, the next steps at Mori Point are: (1) adding a few benches in key spots along the enhanced trails, (2) adding a trash can at 2 additional entrances of the park, and (3) installing “way-finding” signs that provide trail names and distances to key destinations. If you’re interested in contributing a memorial bench at Mori Point, please contact me for more information. On behalf of all the temporary staff down at Mori, I want to thank you and all the other park friends we’ve met during this year’s project! It’s been a true pleasure working down at Mori and we’ll all miss it now that we’re moving on! I’ll keep you posted about next year’s plans as they are firmed up over the next few months. In the meantime, we hope you continue to enjoy this very special park—and maybe even come volunteer with the Site Stewardship Program, who will continue to take care of Mori Point for years to come! PHOTOS ABOVE: Biomonitor Dan assists LINC participants in proper post-setting techniques. Daniel and I help spread straw for erosion control and weed suppression. 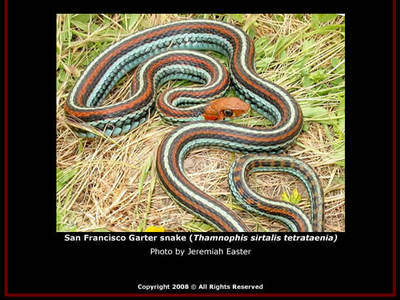 PHOTO BELOW: San Francisco garter snake. Last week, Steve Patton, a Pacifican who served with honor in the U.S. Navy during the Vietnam War, asked us to post a Web site from a group called Vietnam Veterans Against John McCain. We could not verify the information therein but trusted the sender and the source. But after receiving voluminous emails about this post, we removed the text from this post and just left up the link to the site, pending further word from Steve Patton. We stated a fair warning that the sender and the source were responsible for their own allegations. In the meantime, Steve has asked us to take down the McCain post and substitute the above link to a group called Vets for Obama. We hope this resolves the matter to everyone's satisfaction, and we apologize to anyone who was offended. As an all-volunteer, unpaid operation, we do the best we can to post information of interest to all in the community on issues of relevance to our readers, who are citizens of this city but also of this county, this state, this nation, and this world. Sometimes we make mistakes, sometimes our judgment isn't perfect, but we will always try to get it right eventually, with your help. We always respond to corrections and complaints. It's even nice once in a while to get positive feedback, but we seem to learn the most from your outrage. So we will take this as a lesson learned, and move on. Keep hitting that Send button.